HOVER MOTOR COMPANY: If you like car shows, but don't have a show car, how about a '72 El Camino for twenty bucks? Someone is going to do it. It may as well be you, right? The Central Auto Racing Boosters (C.A.R.B.) is selling $20 raffle tickets to win the bright red Elky in the pictures here as a fundraiser for a new racing hall-of-fame and museum. The winner will be announced at the annual C.A.R.B. awards banquet on December 4, 2010. I've been a member of C.A.R.B. for some 20-years now, and I'm always amazed at the level of dedication and loyalty some of these people have to Kansas City-area motorsports. For as long as I can remember, they have sponsored blood drives, golf tournaments, bowling leagues, motorcycle cruises, and more, all with the underlying intent of promoting local racing while supporting charitable organizations. C.A.R.B. was started way back in 1952, and in that time they've gotten behind a number of local circle tracks. Today, the C.A.R.B.-supported tracks are Kansas Speedway, Lakeside Speedway, Central Missouri Speedway, I-35 Speedway, and Valley Speedway. For each of the four short tracks on that list, C.A.R.B. members get free entry into the scheduled C.A.R.B. Night at the Races. Say the ticket price to each track is $10. That means you get $40 worth of tickets. Well, a C.A.R.B. membership is only $10. Seems like a no-brainer to me. But back to the El Camino raffle. C.A.R.B. keeps all kinds of historical records and documentation, plus they own all kinds of neat old racing memorabilia and pictures. And they've been inducting prominent Kansas City racing personalities to their Hall of Fame for years. How cool would it be to be able to go to an actual museum to see all this stuff? I know I'd be first in line! 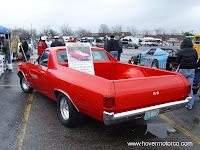 Tickets for the El Camino raffle can be purchased at Seeburg Mufflers in North Kansas City, at the McCarthy Chevrolet parts counter in Olathe, or directly from C.A.R.B. For more information, to learn about joining C.A.R.B., or to get your tickets, visit http://www.kccarb.com/.